Peter Brock holds the record for the most wins with nine. Race record time is six hours 19 minutes 14.8 seconds set by Jim Richards and Mark Skaife in 1991. For the rest of the year, the six-kilometre road along Bathurst's Mount Panorama is a public road. More than two and a half million people watch the race. 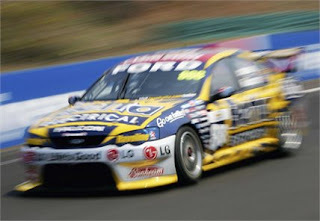 The Bathurst 1000 for V8 Super Cars is 161 laps of the circuit, making up the 1000 kilometres. Track length = 6.212 kilometres in length. Conrod straight = 1,916 kilometres in length. Mountain straight = 1,111 kilometres in length. Altitude = 874 metres above sea level. Steepest grade = lin 6.13.